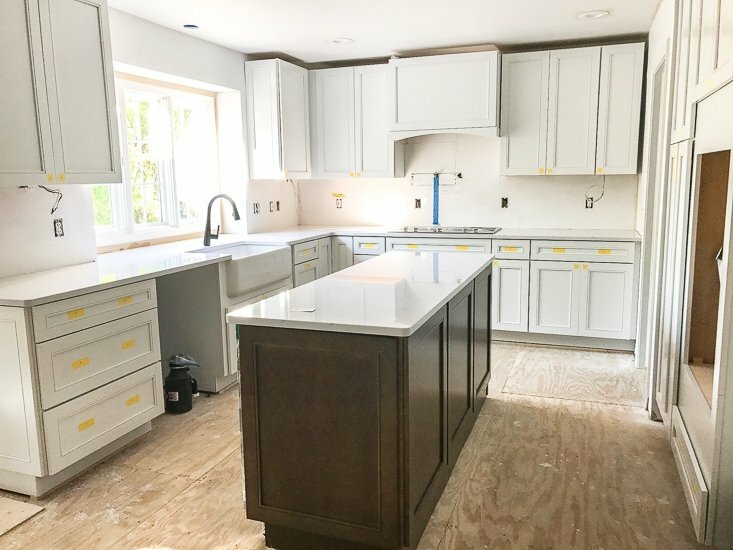 This is the second time that we’ve been able to pick out kitchen counters for our homes in the past year, so as someone who loves making those decisions it turns out moving around has it’s benefits 🙂 We approached each time a little differently, and have learned some tips from experience and from the professionals that we can share! The first step to counters is figuring out what type of material to use. 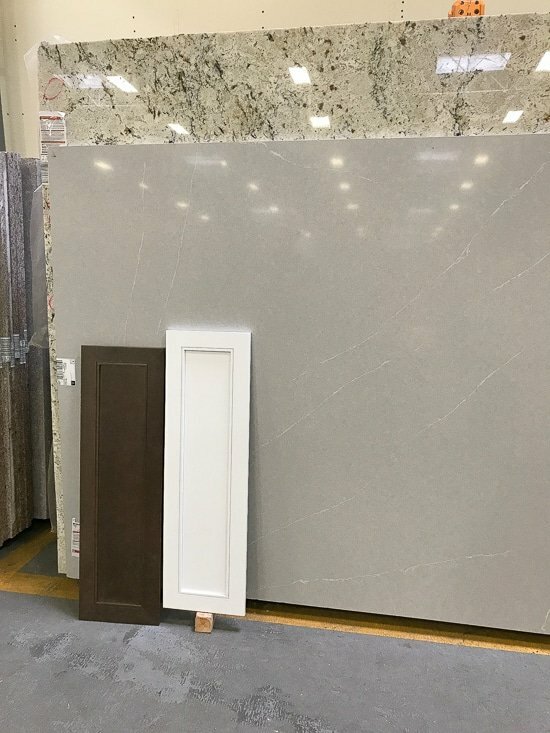 We knew we wanted a stone that was low maintenance and durable, and narrowed it down the granite and quartz. 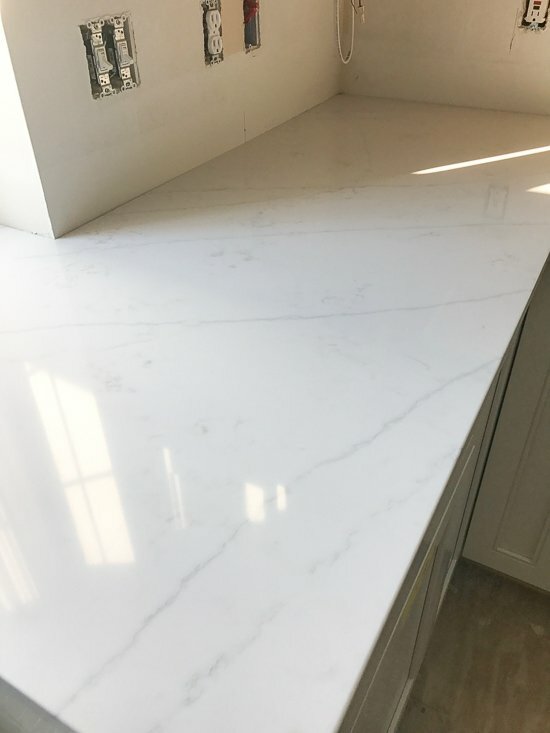 The last time we countertop shopped, we found that the granites we were attracted to were the same price or higher than some of the quartz that we liked, so we opted for quartz since it’s less maintenance than granite. After we decided on the quartz, we talked color. 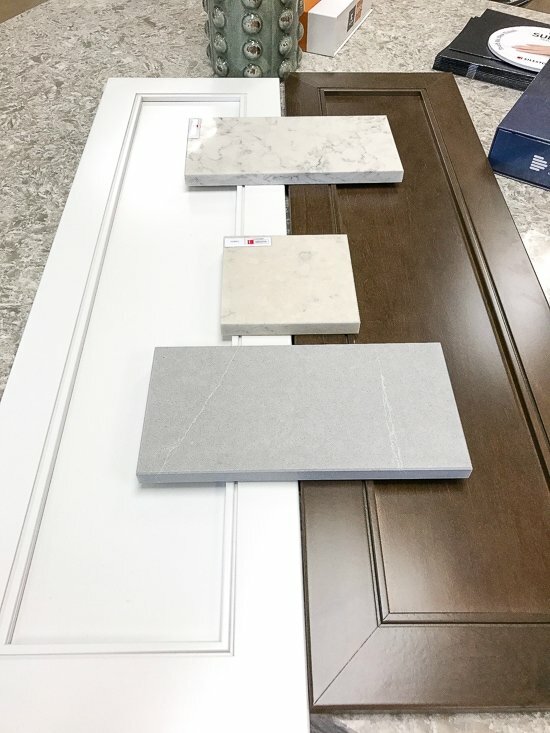 We knew we were working with white and stained cabinets and were leaning towards a white stone with some movement (our last house was almost a pure white with some sparkles in it, so we wanted to try something new) or a simple gray stone. 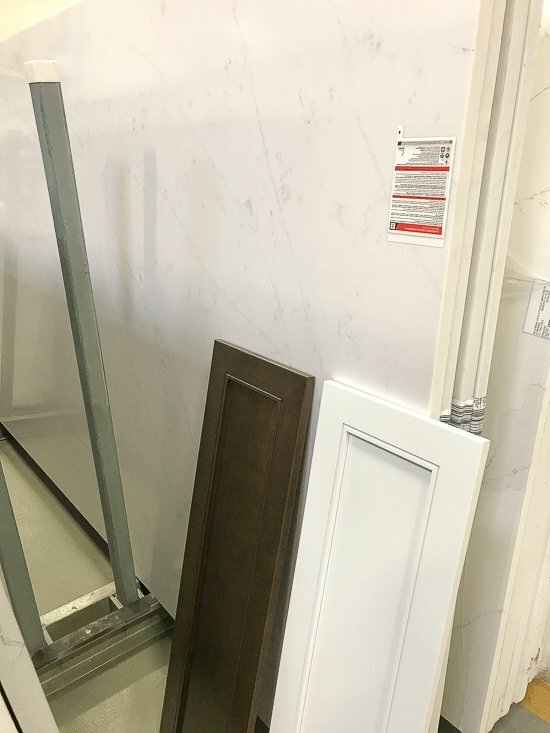 Since there are SO many different whites, we brought in both cabinet doors to the store so we could see how it would all look together. The last thing we’d want to do is spend a chunk of change on a gorgeous stone, only to have it make our cabinets look dull or dingy. The one danger of the slab yard? ALL OF THE PRETTY THINGS. I always get so distracted. Like look at this! I’m not even sure what I’d do with it or where it would go, but how stinking amazing is this stone? I can totally see it in an industrial design with some moody masculine colors around it. 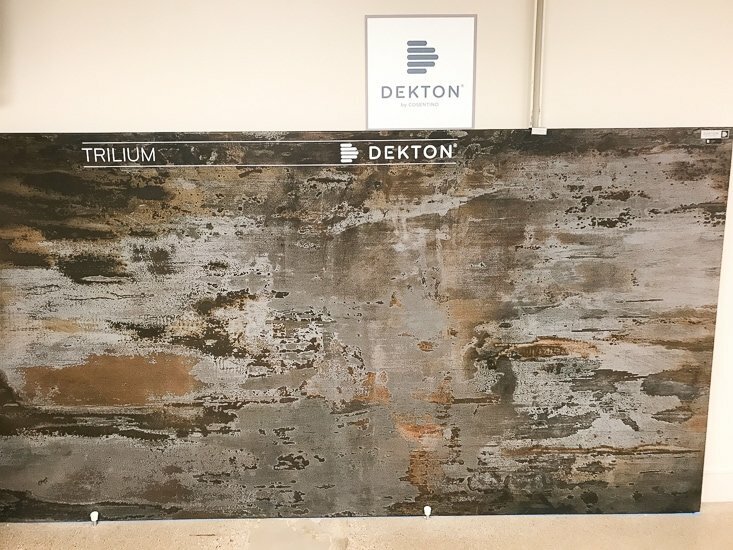 Even after all of that work, the options we thought we liked after looking at the smaller samples turned out to be way too busy when looking at the whole slab. 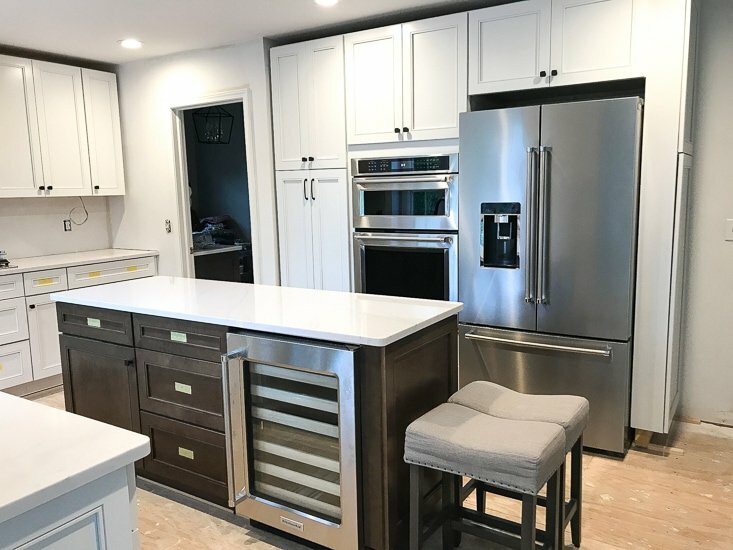 After carting around our cabinet doors to each option we originally liked, we narrowed it down to two very similar options, one white and one gray. I was super tempted by the gray, but in the end we chose the white! The stone is called Eternal Statuario by Silestone. I like that it left us a little more freedom to do something different with the backsplash since both the cabinets and counters would be white, and it has both brown and longer gray veining which tied in with our house and the wood cabinets. 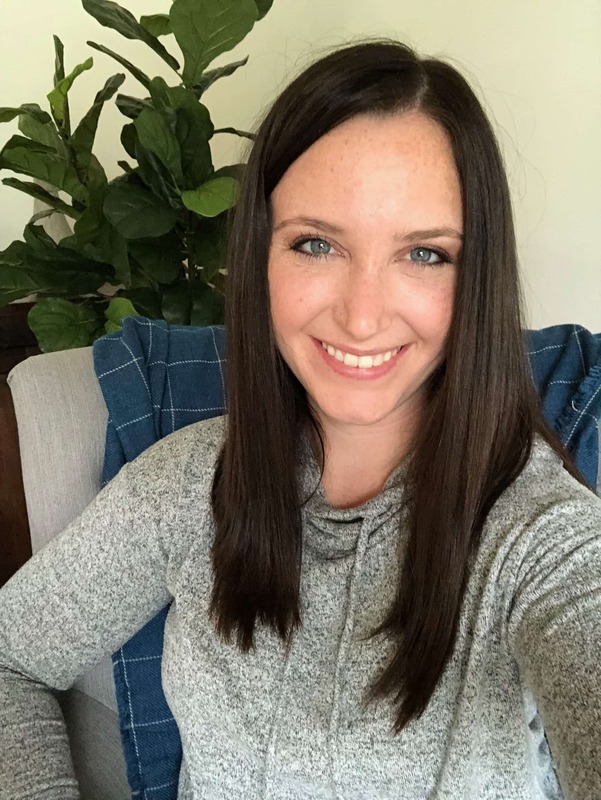 The gray still has my heart a little bit though- maybe one day we can use it in our bathrooms! 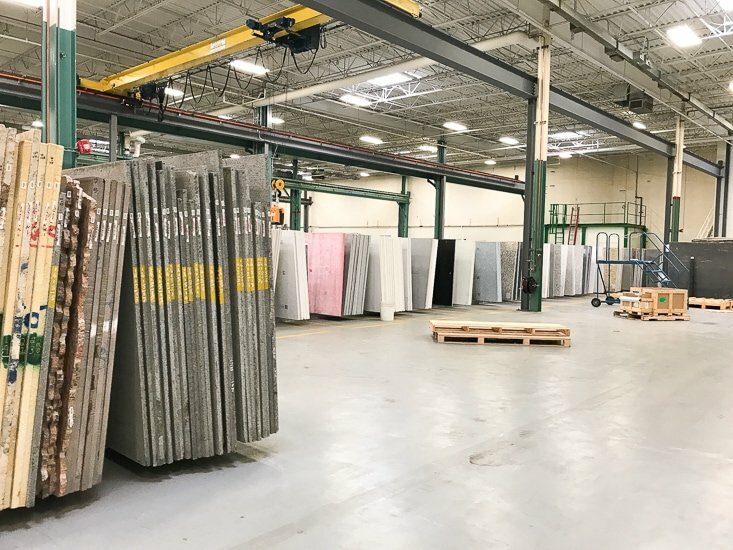 The team marked the exact slabs we chose (which isn’t such a big deal with quartz, but with granite you definitely want to pick out your slabs since they can vary so much!) and we waited a couple of weeks for them to cut and install them. Install day was magical, because it always makes the space feel so darn close to the finish line! From demo to the cabinet install to now, we were finally starting to feel like we had a kitchen again.